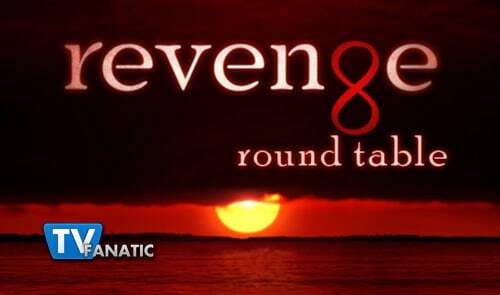 Sunday's Revenge episode marked the return of Victoria Grayson to her throne as Queen of the Hamptons, while setting the stage for the next chapters of the guilty pleasure with new twists. TV Fanatic's Steve Marsi, Christine Orlando, Chandel Charles and Leigh Raines break down all facets of "Confidence" and look ahead to the coming weeks in our Round Table Q&A discussion. Weigh in with your own responses to these Revenge topics below! 1. What was your favorite scene from "Confidence"? Christine: Emily telling Nolan that one day she will find a way to thank him for all he's done. When Nolan told her to find her mom and that would be thanks enough I could have hugged him. I only wish Emily would have. Chandel: Probably the scene between Emily and Nolan when she was telling him she was going to find her mom. Sometimes you get so caught up in seeing them as partners in this that you forget they really are friends. Leigh: My favorite scene was Daniel flipping out and calling the family meeting. It was hot seeing him take charge for once. I also like how he keeps confiding and going back to Emily. I hope he takes her advice on how to play Victoria's game. Steve: I love the flashbacks. Anything that sheds more light on the Revenge universe is eye-opening fun. Especially if it involves Emily and Aiden being chased by wild dogs in Japan. 2. What twist were you the most surprised by? Christine: That press conference. My head is still spinning. Victoria's ability to twist a situation to her advantage never fails to amaze me. Chandel: Victoria Grayson "welcoming Amanda Clarke into the fold." That was some crazy mess she pulled at the press conference. Leigh: That the WMH was in some sort of relationship, possibly in love with, Kara Clarke. Steve: Dec getting caught. Who saw that coming!? Kidding. I have to go with Kara's voicemail to WHM, played by Emily. The combination of pure shock and the fact that he's dead and she's now going dark? Awesome. 3. Madeleine Stowe's awesomeness: Discuss. Christine: I've been a fan of hers for decades but I've never enjoyed her as much as I do here. No matter how devilish Victoria is, I can't stop wanting to see more of her. She's such fun. Victoria simply never gives up and somehow Stowe's performance makes me root for her and want to see her taken down all at once. Chandel: She's just consistently BA as Victoria. And it just.doesn't.stop. It's kind of incredible and a joy to watch. Leigh: Who else could possibly have pulled off that turnaround and the press conference? Then inviting Fauxmanda on stage and presenting that united front? I'm in awe of her craziness. Steve: She's the best. Whether under extreme duress or firmly in command as Southampton's HBIC, her facial expressions are priceless. 4. Is Emily off her game in Season 2? Christine: She's a little more emotional. Now she's not only avenging her murdered father, she's searching for the mother she thought was dead. If she followed Takeda's rules and shut off all emotion she'd be far less entertaining to watch and much harder to root for. Chandel: I think she's just regrouping. I don't think she's sure what her objective is this time around except finding her mother, and it's preventing her from fully comprehending the developments with the Grayson family. Leigh: I don't think so, I think she's just refocusing. She's been thrown a wrench or two and needs to shuffle stuff around but she still knows what she wants. Steve: If she is, she may not have much of a choice. The game has changed, and Emily's battling conflicting emotions regarding a number of key players as well as countless external factors beyond her control. As long as she brings Nolan back into the fold, the Revengers will regain their focus soon enough. 5. What secret(s) did WHM take to his grave? Christine: That he was in love with Emily's mother for one. There's no other explanation for keeping her safe for that many years. Besides that I'm sure there's an entire treasure trove of secrets to be found. Chandel: I'm not sure, but apparently it involves being intimately familiar with Emily's mother. Only time will tell how that relationship developed. Leigh: Probably enough on the Graysons to write an encyclopedia on sociopathic tendencies. The amount of information that man has knows now boundaries. 6. Who has the best romantic chemistry with Emily: Daniel, Jack or Aiden? Christine: You know what? Emily and Nolan's platonic friendship is far more interesting than her scenes with any of these guys but if you're looking for romantic chemistry I'd have to go with Daniel. Leigh: Aiden. I want to know more. They have similar agenda and mentalities. There's a type of compatibility that she can't find with other people. That being said, I agree with Christine (per usual) that Emily and Nolan's friendship is the best chemistry of all! Steve: Nolan is the man, and his relationship with Emily is my favorite thing about the show. I think it's destined to remain platonic, however, and that's for the best (hence his exclusion from this question). There's definitely a spark between Emily and Daniel, but the other two both have strong connections to very different parts of her past. This is shaping up to be one complicated, Revengey love quadrangle. 7. Victoria and Conrad are getting re-married. Who will the season's rumored second wedding involve? Christine: I'm still hoping for Daniel and Emily to tie the not so that they can work together towards driving Victoria insane. Chandel: Wouldn't it be great if Emily's mom suddenly appeared?! Leigh: I thought Amanda and Jack, but I really don't know. This show manages to surprise me every week. Steve: Maybe something less obvious, like Daniel and Ashley. She's got to have a big storyline coming up. As for Victoria's wedding dress, she puts the GRAY in Grayson apparently (shout out to reader cjoylicious for that one)!